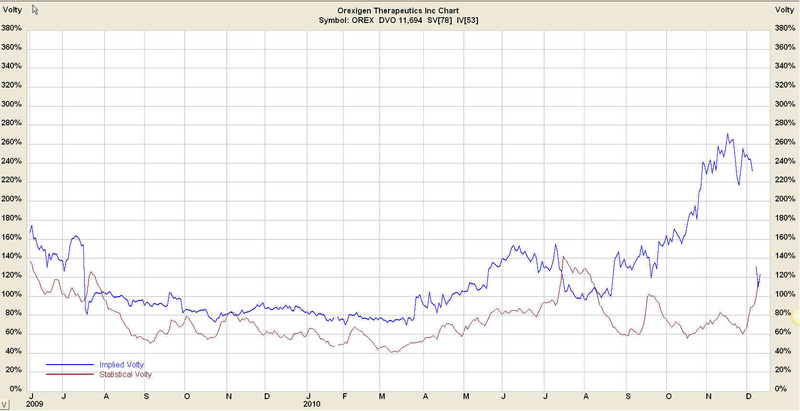 IV effects exert a major force on option pricing. There are certain consistent changes in IV which relate to uncertainty surrounding defined events expected to result in significant changes in the price of the underlying. I have since received some questions about some of the specifics of the behavior of IV and thought it would be helpful to discuss a few details that are necessary to understand in order to apply knowledge of IV to your option trading. Let’s dive in and consider some of the “nitty gritty” issues on this topic. 1. How do I know the current status of IV for the particular underlying in which I am considering a trade? There are really two “volatility weather” reports of which you want to be aware. It is similar to the skier who wants to be aware of both the general weather conditions he may encounter but needs also to understand the specific conditions on the trails he plans to travel that day. The first is the widely available status of general market volatility that is reflected in the volatility of broad based market indices. There are several of these broad based measurements available. The most widely recognized one reflects the volatility of the S&P 500 index, the VIX. This value is widely available in all charting packages and is easy to find. The next group of data of which you want to be aware is not as widely available and not as frequently discussed. This is the historical information of the volatilities of the specific underlying for which you are considering a trade. These are like the specific conditions of the trails you want to ski. Such data are available from several sources and include option savvy brokers and from several proprietary vendors. Several things are worthy of perusal in this chart. First, notice that both HV and IV are displayed (this chart uses the term SV for HV, so don’t be confused by that). Second, the IV and HV (SV) are low and currently trade in the first percentile of their historic range as indicated at the top of the graph. Second, notice that IV and HV (SV) move together usually but IV displays spikes that diverge from HV as marked by the vertical ovals. Thought question for extra credit: Look at the vertical ovals; do you notice any associations between IV and HV(SV)? I’ll come back to that in a moment. In summary, AAPL options are cheap as reflected by IV being lower than it has been 99% of the time over which this database has been calculated. 2. How does IV react to upcoming events expected to impact price of the underlying? As discussed in the previous article about IV, it is a “forward looking” variable which reflects the aggregate opinion of traders as to future price volatility of the underlying. This makes sense from an intuitive point of view since upcoming periods of dramatic price changes would only be expected to increase the price of options as traders positioned themselves to benefit from such moves and increased demand for buying options. As a result of this activity by traders, options routinely become more expensive as significant upcoming events approach. IV routinely increases as earnings come closer, but some of the most dramatic increases in IV are seen in the options of small biotechnology firms awaiting FDA rulings. These rulings have the capacity to impact the price of the stock dramatically and option prices are routinely “bid up” as these events approach. As we discussed in my last post, the only way these changes can be reflected in option prices is by dramatic increases in IV. In my skier analogy we are moving from the bunny hill to the double black diamond mogul run. As an example of this phenomenon, consider the case of OREX, a biotechnology firm which received FDA approval for its anti-obesity drug December 9. This decision was anticipated for several months and it shows in the IV profile of the stock as demonstrated below. Notice the dramatic increase in IV as the FDA decision approached, and the IV collapse following the approval announcement. The drug was approved and the price of OREX increased dramatically; as a result of the removal of the uncertainty surrounding this event, IV collapsed. How would a call buyer have been impacted? Had you bought the at-the-money call on Monday prior to the decision when the stock was trading at $5, that call cost $1.50 when the IV was an astronomical 420%. Following the announcement, the price of the stock rose to $9.41; the call was worth $4.4, its intrinsic value. The call buyer would have profited $2.90 while the buyer of the stock would have profited $4.41. Obviously both traders would have been happy but the call buyer would have seen his profits as only 2/3 those of the stock buyer. The price paid for the initial call purchase consisted of 100% time (extrinsic) premium. It is this component which has vanished as a result of volatility collapse. In addition, deep in-the-money calls which this strike now represents as a result of the dramatic price rise of the stock almost never carry significant time premium. As an aside, we will return to the topic of in-the-money options and the potential utility of the minimal time premium within them in future postings. 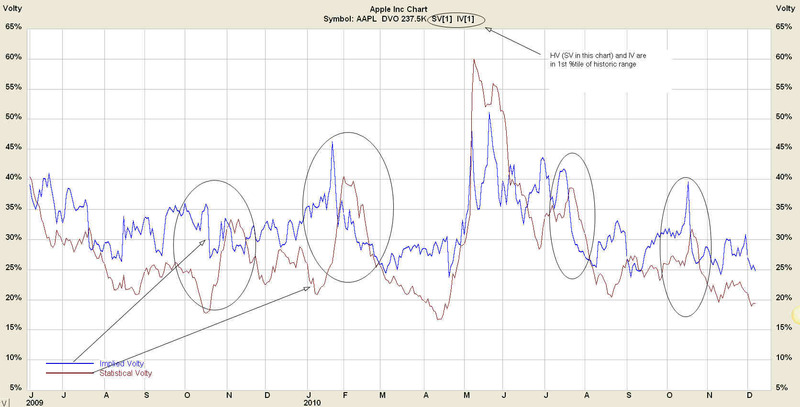 Now, let’s return for one last look at the AAPL volatility chart we discussed above. Notice how the spikes in IV within the vertical ovals are followed by spikes in HV of the underlying. Who says IV spikes are not predictive of movement? These are but a few examples of the implications of being familiar with the nuances of IV. This discussion is but a start and there is much more to be covered in order to deal with this variable. For example, trades can be constructed to respond constructively to increases in IV (the family of positive vega trades), decreases in IV (negative vega trades), and no change in vega (vega neutral trades). We welcome your inquiries to our mentoring program to help learn how to deal with this and other factors essential to trading options successfully.